Let us analyze this newspaper advertisement. 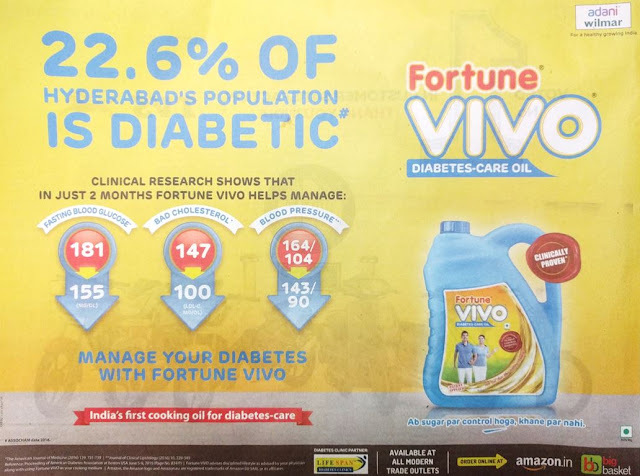 "22.6% of the people living in my city (Hyderabad) are diabetic." That's a big number. That's the attention grabber in this ad. This oil claims to help achieve three things. One, reduce blood glucose. Two, reduce bad cholesterol, and three reduce high blood pressure. This paper ad ends with two sentences. One, 'manage your diabetes with Fortune Vivo' and 'India's first cooking oil for diabetes-care'. What's broken in this ad? This ad will have more impact if it stuck to one message. The header talks about diabetes. The bottom two lines talk about the same. But what do the icons talk about? Diabetes, BP and Cholesterol. This ad will have a stronger impact if it sticks to diabetes and avoids cholesterol and BP. Deliver one and only one message on one slide. Resist the temptation to appeal to all kinds of audiences and say unrelated things. You can say other things on a different slide. 22.6% is not a number that everyone can appreciate. A number does not have any emotional appeal unless it is 0 or 100. How do you represent 22.6 for a more visceral punch (which emotionally affects your audience)? One way is: 'More than 1 out of every 5 people in your city' suffer from diabetes. That's more relatable. If I have 5 friends, at least one of them is diabetic! This registers more strongly. Numbers like 22.6% do not have that power.